While pledging $500 million for housing affordability, Microsoft also asked nine Eastside mayors to support land use changes to ease development. The mayors are enthusiastic about the money, but realistic about the controversies that sometimes follow affordable housing efforts. Microsoft pledged its ample balance sheet to influence affordable homebuilding in the Seattle area. But as part of its $500 million pledge, it also asked regional cities to ease constraints on housing development — and that request is running into the messy politics of local zoning. With former Washington governor Christine Gregoire handling the lobbying, mayors from nine suburban King County cities — including Auburn, Bellevue and Kirkland — were asked to sign on to a letter that commits them to consider policy changes in seven specific areas. The requests include streamlining the permitting process for affordable housing developments, revising zoning laws to promote population density and waiving parking requirements for projects close to transit hubs. The mayors who signed on said they’re pleased with the cash infusion in a region that’s in dire need of housing. But even with the Redmond tech giant’s backing, some mayors say increasing affordable housing stock remains a challenge, in both their respective city halls and in communities that may be resistant to the changes. The company’s pledge includes $475 million in loans for low- and middle-income development projects, plus $25 million in grants to address homelessness. Kirkland Mayor Penny Sweet called Microsoft’s push into affordable housing development “fabulous.” Sweet said she hopes that driving new money into the market will allow Kirkland to offer more housing options for the retail and service-industry workers who work in shops in the city’s upscale downtown district. “We just haven’t had the tools to address it, and this helps,” she added. Sweet says housing development in the Eastside suburb is hampered by the high cost of property and resistance in single-family neighborhoods to upzoning, which would allow developers to pursue projects reaching up to five stories. Bellevue Mayor John Chelminiak said changes to zoning laws are inevitably controversial, with more resistance at some sites than others. 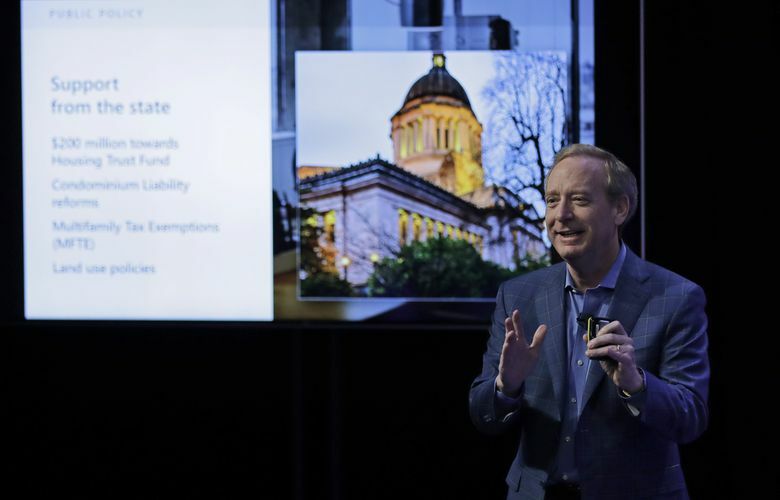 Microsoft hasn’t specified exactly how it will invest money, but he cited two planned housing projects that could benefit from funding: One for families who earn middle-income wages but have been priced out of the housing market, and another for lower-income families. In Federal Way, Mayor Jim Ferrell said the city has already seen the impacts of adding affordable housing at a rapid pace. Federal Way absorbed 1,000 units in three apartment complexes within a few years. It had a direct effect on local schools, he said, and he heard from longtime residents who were concerned. But the city continues to have a need for housing, he added. The average monthly rent for a Federal Way apartment in 2018 was $1,388, according to Apartment Insights/RealData. In Redmond, rent was $1,595, and Kirkland, $1,935. The letter to Microsoft that Sweet, Chelminiak, Ferrell and other mayors signed isn’t a promise that they’ll move forward on each of the requests that are outlined. Among the requests from Microsoft is for cities to reduce impact fees on new development, which under state law can be used to pay for schools, roads, parks and fire stations. Seattle does not charge impact fees, but many others do. Bellevue and Federal Way, for example, charge transportation impact fees, and Redmond, Kirkland and Sammamish charge school impact fees. Ferrell was also cautious about Microsoft’s request for cities to offer public land to housing developers at no charge or at deeply discounted prices. Between cash and short-term investments, Microsoft’s balance sheet shows it has about $153 billion in reserves and short-term investments. It is adding 2.5 million square feet to its Redmond headquarters and plans to renovate another 6.7 million square feet, with enough room for an additional 8,000 employees. Redmond wants those employees to live where they work, Mayor John Marchione said, and that requires housing not just for the engineers, but for lower-paid workers who might not be able to afford housing nearby. A steep increase in housing prices has created a gap in middle-income development, he added. The need to house the workers in their city was echoed by Issaquah Mayor Mary Lou Pauly, who said two-thirds of the jobs in Issaquah are in service and retail, which means people are having to drive into work from a more affordable area. Microsoft’s plan could be seismic on the Eastside, said Villette Nolon, CEO and president of Imagine Housing, a nonprofit that provides affordable housing for Eastside low-income families. The area is often underrepresented in conversations about homelessness and housing affordability, in part because it’s made up of several small cities that lack enough capital to address the issues, said Nolon.